Brig. Gen. Alexander I. Kozlov, Lt. Gen. John M. Brown III and Brig. Gen. John Y.H. Ma performed an inspection yesterday during the 9th Regional Readiness Command Change of Command Ceremony held at Fort Shafter Flats. Kozlov assumed the role as the new commander, succeeding Ma, who has held the post since December 2002. 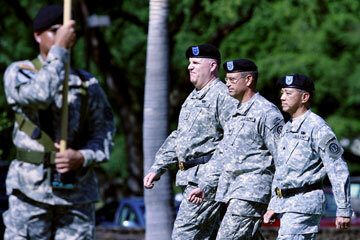 The Pacific Army Reserve consists of 24 units with approximately 3,500 soldiers based in Alaska, Hawaii, Japan, Korea, American Samoa, Guam and Saipan.